For this week’s Medieval Romance Monday we are pleased to feature the newest medieval romance novel from Vijaya Schartz – Seducing Sigefroi. Seducing Sigefroi is Book 3 in Vijaya’s Curse of the Lost Isle series. My hero, Sigefroi of Ardennes, is a true historical figure, the founder of Luxembourg. Legends abound about the history of the period, which is steeped in myths. But the real challenge in writing this book was to bring to life a famous man and remain true to his character, the period, and the history. Despite all my research, including several trips to Europe, I collected very few details, and most of them were historical facts. 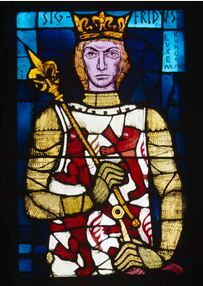 I knew he was a shrewd warrior knight, I saw representations of him in full battle gear on stained-glass windows, I could tell from the set of his jaw that he was a man of action. He was ambitious. And he was feared… I had to find his soft side. According to legend, his first love was Melusine, the Fae of legends. What must it feel like, for a fiercely Christian knight, close to the emperor and to the Roman pope, to fall in love with a woman tainted by Paganism? But it was also a joy to be inspired by facts and find in them fodder for human emotion. I hope readers of history and readers of romance alike will fall in love with the ambitious and flawed man who was Sigefroi of Ardennes, and later became the first Earl of Luxembourg. I even saw with “mine own eyes” in the Luxembourg Museum of History, the deed signed in 963 in a scene described in the book, the rolled piece of parchment with its hanging ribbons and dangling wax seals, now faded by a thousand years of dust and history. Book 4, coming in late 2012, LADY OF LUXEMBOURG will continue the Curse of the Lost Isle series, with Sigefroi and Melusine, and what happened next in their historical saga. You can read an except from Seducing Sigefroi right here on Medieval Romances. You can also read excerpts from the first two medieval romance novels in the Curse of the Lost Isle series here on Medieval Romances. Book 1 – Princess of Bretagne and Book 2 – Pagan Queen. This entry was posted in Blogs, Medieval Romance Monday and tagged medieval romance monday, vijiya schartz. Bookmark the permalink. Vijaya, thanks for participating in our Medieval Romance Monday feature. Best of luck to you on the Curse of the Lost Isle series! Thank you for your kind comments, Helen. I’m really enjoying the process of writing this series.